Qualitative home-use MFD will be of service to painters, photographers and admirers of quality images. This printing device has pretty compact dimensions. But nevertheless it has a lot of useful functions except of scanning, printing and copying. The designers made their best to provide you with handy usage and splendid quality of photos. You will really enjoy printing, if you buy this MFD. Printer XP-750 has a contact scanner. Due to its resolution of 2400x4800 dpi, it will render images on the monitor and they will be similar to originals. Moreover, the high speed of printing of the device can be considered as one of the most important advantage. To print photos of 10x15 format you need just 15 seconds. Every user will appraise the functionality of the device, its quality, printing characteristics and high speed of operation. Moreover, all the required connections are available. The design of the MFD in question is rather simple. It is compact and due to its modern look it will fit any interior. The control panel is very stylish. The location of connection slots is handy. On the frontal zone there is PictBridge connection slot, card rider and USB-connector, but they were located carefully, so they are not visible. The card rider supports all flesh-cards, including CF format. The sensor LCD is worthy of special attention. It has 8,8 cm diagonal. The buttons, which are situated on the each side, are brightened when active. Due to the availability of wide range of interfaces, Multifunctional printer Epson XP-750 can print wirelessly vie Wi-Fi module. Due to Ethernet network cable it is possible to print from several computers. Moreover, Wi-Fi Direct menu will allow and ease printing form peripheral devices with availability of Wi-Fi. Also, Epson can be proud of Epson Connect option. Due to it, it became possible to print from tablet PC, Smartphone and other devices wirelessly. Epson Company represented this devise as a photo center for home usage. And this definition is true. Printing head is the most important detail of the printer. In this device Micro Piezo technology was used. This printing head is the base of the device; it is reliable and will serve you for years. Due to its piezoelectric technology it became possible to control the volume of ink drop and to choose the minimal size. Moreover, the printer can regulate the ink interaction with paper. Epson Company devised a technology, due to which it became possible to print with ink drops of variable size. The principle of operation of this technology is that light-colored details of the images are covered by ink drops of larger size, but the smaller details is covered with drops of small size. The size of ink drop is just 1,5 picolitres. The maximum resolution of the device is up to 5760?1440 dpi. Due to such characteristics you will get pretty good images. Also, this MFD can print on different mediums, such as CD/DVD disks and use all types of paper. Despite of all the merits of All-in-one printer Epson XP-750 there is one disadvantage. The original consumable materials are very expensive, so you have to spend a lot of money for original cartridges. But there is a good solution to this problem. It is Continuous Ink Supply System, due to which you will be able to make savings; you will not lose in quality. You just have to install it and then to use for years. When your printer runs out of ink, you will not spend time and money for cartridges. You just have to refill CISS once in a while. On our website you can find a wide range of qualitative alternative consumable materials for a low cost. They will fit any inkjet printer, for example Epson Stylus TX419. So, by using CISS you will get economical printing, moreover, CISS will guarantee the stable operation, because you will not have to change the cartridge and the printing head will be in safety and as you know, it is the most expensive detail of the printer. 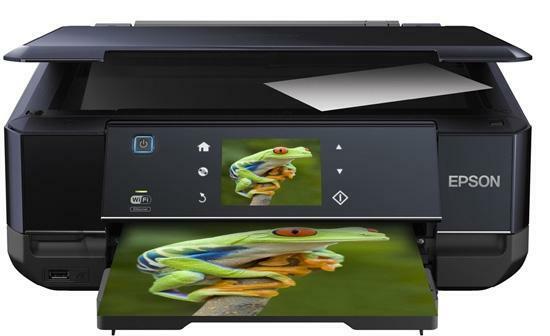 Taking all the aforesaid into consideration, Epson printer XP-750 will provide you with qualitative colorful photos and due to the availability of CISS, the printing will be rather cheap. From our website you can buy a lot of MFD and printing devices, such as Epson Stylus CX9300F and others. You can purchase them without any difficulties right now.